by Pellet Presses - July 27th, 2011. Filed under: information of Pellet Press Machine. If you are contemplating venturing into the field of manufacturing your own pellets, one important aspect that you need to take into consideration is the pellet machine that you are going to purchase to make the procedure a success. In addition, before buying a pellet machine it is imperative that you first understand all aspects about the machine that you are eyeing, and the process of manufacturing the pellets. 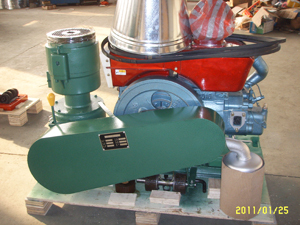 There is a wide range of pellet production machines today, which differ in model, size, and brand. However, Pellets making is a very profitable venture. In case you are contemplating to manufacture wood pellets in particular, there are things you ought to think about. Contrary to popular belief, to put together wood pellets you do not just take sawdust, heave them onto a pellet machine, and wait for the utmost quality pellets to emanate from it. For you to succeed in making your own pellets there are guidelines that you will need to follow. For instance, you must understand the right moisture content for the materials that you intend to feed into the pellet mill. The materials ought to contain a moisture percentage of 10%, which helps them in binding together solidly. Note there is a big difference between wetness and moisture content.